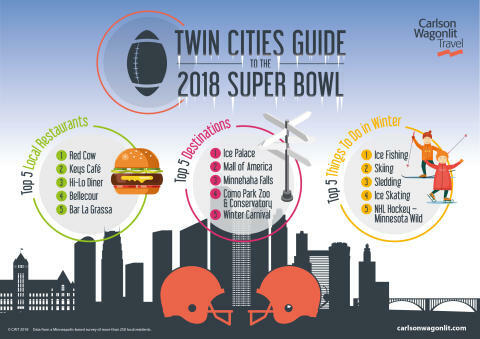 Carlson Wagonlit Travel recently polled 250 Minnesotans for their recommendations on local restaurants, attractions and activities for visitors coming to Minnesota for Super Bowl LII. The online research, conducted between Christmas and New Year’s Day, found a sense of dawning excitement about the Super Bowl and active engagement, with plenty of suggestions to keep visitors busy and full on their trip to Minnesota. Some suggestions were obvious, such as The Mall of America, as was ice skating, which should be expected in the self-proclaimed State of Hockey. While some Minnesotans picked chain restaurants such as Chipotle and Applebee’s, most chose local fare as the places to go. The most popular local Twin Cities choice was the Red Cow, a restaurant and tavern known for its gourmet burgers and beer. Running a close second was Key’s Café, a local diner in the Twin Cities known for its big portions. 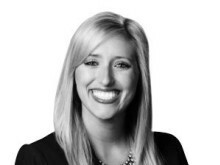 Rounding out the top five local places to eat according to Minnesotans are: The Hi-Lo Diner, Bellecour (a French bistro and bakery) and Bar La Grassa (Italian flair and wine bar). For a unique experience, you can try eating in a rail car at Mickey’s Diner in St. Paul. When it comes to winter activities, there is plenty to do in Minnesota. If you need more sports, locals suggest heading to St. Paul for a Minnesota Wild hockey game (tickets are limited). However, if you’re willing to try walking on water, Minnesotans list the top winter activity as ice fishing. With more than 11,000 lakes, Minnesota has no shortage of opportunities to try fishing during the winter – but dress warm (and maybe try a guide to improve your chances). The second most popular activity according to Minnesotans is skiing. You have your choice of numerous slopes in the area from Buck Hill where Olympic champion Lindsay Vonn learned to race, to the many hills of Afton Alps. Rounding out the top activities included sledding and ice skating. While everyone knows about the Mall of America, it didn’t take the top destination for Minnesotans this winter. That distinction goes to the St. Paul Winer Carnival Ice Palace. At a cost of more than $800,000, the structure will be 70-feet tall and feature six towers. The Ice Palace, which is free to the public, is made from more than 4,000 blocks of ice, each weighing more than 500 pounds. If you don’t mind staying outside, you can hike along the frozen Minnehaha Falls. Or, another popular destination according to Minnesotans is the Como Park Zoo and Conservatory.